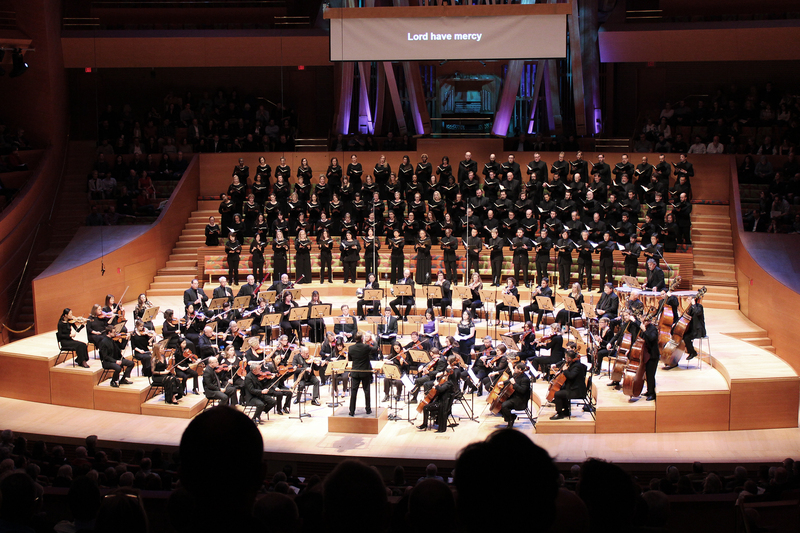 When the Los Angeles Master Chorale originally planned Beethoven’s Missa Solemnis for January of its 2016/17 season, the two performances, let alone the inauguration of a new President of the United States, were still more than a year away. There was no political statement, expressed or implied, in its scheduling, no inherent message of defiance or rebellion in its libretto. I doubt that the powers-that-be thought they’d need or want such a thing. Yet when the time arrived, it was nearly impossible to ignore the politically charged climate in which performers and audience members found themselves. The first performance, a Saturday matinée, was being held concurrently with the Downtown LA women’s march protesting against President Donald Trump, who had just been sworn into office the day before. Some concertgoers reportedly had to make their way through Grand Avenue marchers to get into the concert, while some of the protesters were roaming the Walt Disney Concert Hall lower lobby in desperate search for restrooms. By all accounts, the resulting hodgepodge of people in the lobby and the sights and sounds of the march created a unique prelude to the concert. The Sunday evening performance was more conventional in its pre-concert setting, the protest march having been over for more than a day. Yet the general feeling of tension lingered. As if to acknowledge the obvious, Grant Gershon, the Master Chorale’s Artistic Director, referenced the “extraordinary weekend in the city” during his brief pre-performance remarks while tastefully avoiding any overt political statements; the majority of audience and choir members cheered loudly at the implied unity with the protesters while others sat politely silent. With all of that going on, it would be easy, therefore, to try to view this concert through a political, even subversive, lens — a statement piece, if you will. I’d prefer not to do that. There is enough variety in the Latin mass text to enable one to find a phrase fitting for any occasion. There’s no need to invent connections or infer a greater meaning when one can take Beethoven’s late-period masterpiece at face value. The sprawling Missa Solemnis is by its very nature a statement piece. It blares and churns and wallops and sometimes even soothes to great effect. Mr. Gershon’s approach was pedal to the metal, emphasizing power and momentum at almost all cost; it worked, in breathtaking fashion. More notably, he favored a bright, top-heavy sheen from his singers that one almost never hears from this choir. The result was less successful, creating a more generic choral sound than the Master Chorale’s distinct bass-dominant “pyramid sound” which is traditionally its trademark. The four vocal soloists were solid, but with varying degrees of success. Mezzo-Soprano Allyson McHardy was the standout of the group, matching a warm timbre with great sensitivity to the text. Tenor Arnold Livingston Geis (a Master Chorale member) was good overall, though his voice sometimes became pale and constricted at the upper end of his range, especially at louder volumes. Baritone Rod Gilfry, a Los Angeles favorite, does not have the biggest voice but his rich tone was as resplendent as ever in his limited solo opportunities. Only Soprano Raquel González was a bit of a disappointment, often having trouble blending with her three colleagues and occasionally experiencing problems with softer entrances. As a group, the foursome was often over-powered by the choir. Mr. Gershon chose to position the quartet at the center of the throng of performers, in front of the choir but behind the orchestra’s strings in the space normally occupied by woodwinds. I wonder how differently the performance would have sounded if they were placed at the front of the stage instead. The orchestra, a pick-up group comprised of Southern California’s deep bench of freelance musicians, was excellent in their own right. Concertmaster Roger Wilkie’s solo in the Benedictus was perfectly sweet, and principal clarinet Gary Bovyer stood out throughout the evening. 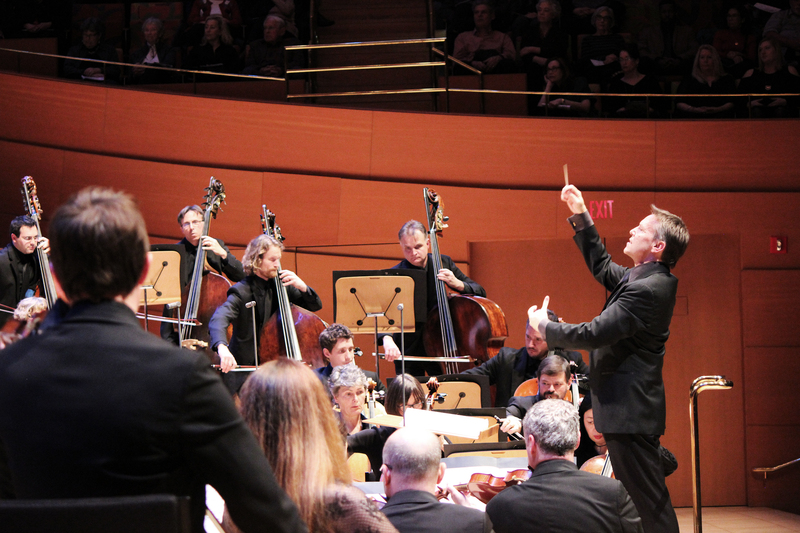 Next up on the Master Chorale’s season schedule is a March 26th performance of Les Noces (The Wedding) by Stravinsky, though their next WDCH appearances will be as part of the Los Angeles Philharmonic’s presentation of Nixon in China by John Adams, with the composer conducting performances on Friday, March 3, and Sunday, March 5. Tags: Allyson McHardy, Arnold Livingston Geis, Beethoven, Gary Bovyer, Grant Gershon, Raquel Gonzalez, Rod Gilfrey, Roger Wilkie. Bookmark the permalink.